We all know the saying the 3rd time is the charm and this year’s SCCA National Championship Runoffs was no exception to the rule. The past 2 runoffs I have not made it to the finish. In 2016 at Mid-O I was hit on the first lap and punctured my left front tire. At Indy, I retired as we developed a fault in the ECU from some beta software we were running and the car dropped into limp mode and I wasn’t able to maintain full throttle. We have been working on the brakes for the past 3 years and during the season it limited us from running the car as much as we like. We have also been chasing a fault/error with the ECU/control system of the car. We were still able to get the car enough starts and race finishes to get qualified for the runoffs in Sonoma. Granted the car was not happy at most of those races and it was a struggle to get the finish. 2 weeks before the runoffs we sorted out the ECU problem and were confident enough in the car to race it. The backup plan was to race my Spec Miata if we couldn’t get the Mazda 3 fixed as I ran it this past season as well and had enough starts/races. 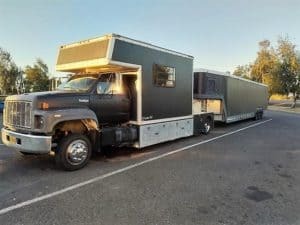 With the Runoffs at Sonoma it was within 1-day driving distance unlike the past 3 runoffs at Daytona, Mid Ohio, and Indy so I got to try out the new (to me) truck and trailer. I had raced at Sonoma one time prior, so the track wasn’t totally unknown like Mid-O and Indy, which all I had was simulator time so I was able to get up to speed quickly on a test day and find out what I needed to work on for chassis setup and driving. The driving was easy to adjust, look at the data, see where the driver was sucking and had to man up to keep a foot to the floor in some sketchy corners. The car, on the other hand, had what we call “a good problem to have”, too much power. We have been running a torsen style differential in the car which works pretty good in a straight line and relatively flat tracks. Sonoma is not a flat track which unloads the car 3-4 times per lap. With the Mazda 3 and the amount of torque it makes means I was unloading the tire enough for it to spin the inside tire. Most people think what is the big deal with a little tire wheel spin? It is a problem when you enter turn 10 at Sonoma at 97MPH and you start lighting off your right front tire. Look at the picture below and you can see that front inside tires is barely on the ground and the rear isn’t. The speedometer would jump around and you could see the right front wheel speed turning at 5-10 mph more in the data. 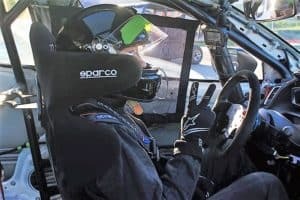 We tried several suspension changes and driving style changes to make the best of it but in the end, we were way off the pace by 2-3 seconds of the rear wheel drive cars in the class. The good part about not being at the front of the field, there was zero stress when race day came. Like any race there was a fun challenge, we would be heading into turn 2 blind as the race was at 4 pm in the afternoon and the sun would be shining directly down the hill. Since I wanted to see the end of the race I a little cautious at the start and Ali in the other Mazda 3 got around me at the start. We fought it out for 8 laps and he went into turn 6 too hot and I was able to get under him and pass him on the inside. After a few laps I put a 4-5 second lead on Ali I was basically in no man’s land, slower than the front guys and faster than the back half of the field so I spent my time working on tire management (it is easy to overheat your left front tire at Sonoma) and made it to the end of the race. My official finishing place was 10th but after some adventures in tech, I was moved to 9th in the final results. This isn’t where I wanted to be by any means but the 3rd time was the charm and I made it to the end of the race. Huge thanks to the support we get racing the car from CorkSport, BFGRacing, Monarch Inspections, G-Loc Brakes, and Mazda Motorsports. 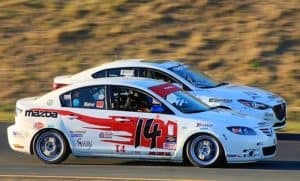 Derrick gives you a look at what this year’s SCCA National Championship Runoffs looked like, from prep to racing. 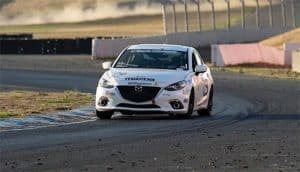 For our Mazda 3 racing in the runoffs poses challenges for both the driver and the car. 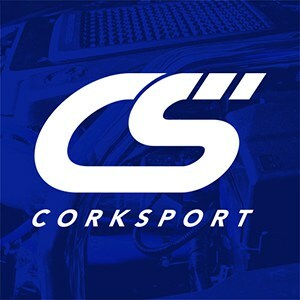 Check out the CorkSport Mazda3 as it races this season.